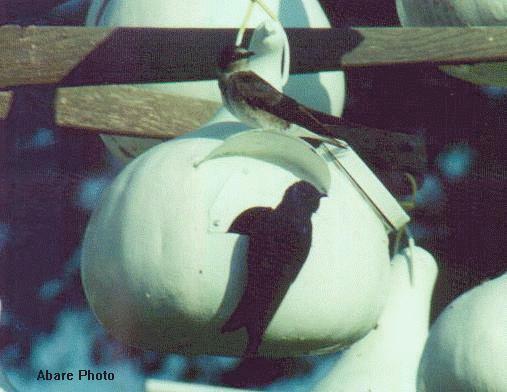 If you plan to use gourds as your choice of housing for your martins, then on this page, I'll attempt to describe what's required to turn natural gourds into housing for Purple Martins. 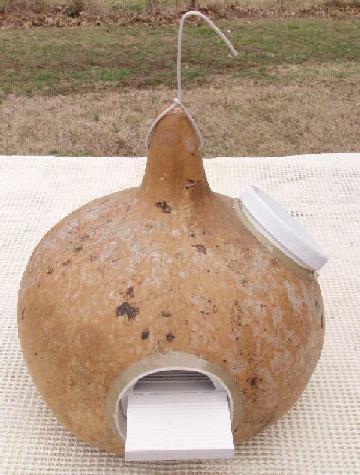 Gourds can be used to house other cavity nesting birds also, and the same general criteria will apply. 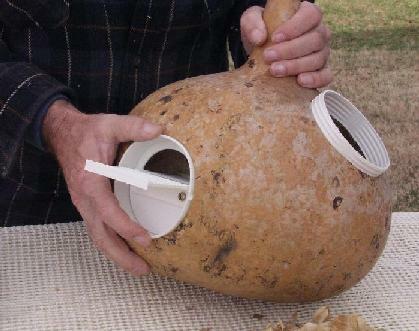 Just use the proper size gourds and entrance holes for that species along with the proper location. It's common knowledge that martins love a good large natural gourd to nest in. It might be the feel or the looks, but what ever it is, they flock to them. If gourds are going to be your preferred housing, then the following are a few tips to make them into martin houses. Obviously, you'll need some gourds. Make sure they're nice and big, at least 9 or 10 inches in diameter and as thick walled as you can get. The thicker the wall, the better. General shape and looks are your own preference. The martins don't care about their shape but some people like to use particular shapes. You'll need a jigsaw with a scroll cutting blade. This will allow you to cut the round curves of the holes. A drill with a 1/4" and 3/8" bits, for drilling the hanging and drain holes. A wood rasp with one side rounded. A plastic entrance port with a screw on lid that is at least 100 millimeters in diameter... (Approximately 4"). You need to be able to get your closed fist through the opening. (See details below). An entrance port with 2 porches. (Again, see details below). A large container large enough to hold at least 5 gallons of water. A pot scrubber of some sort. The stainless metal ones seem to work the best. 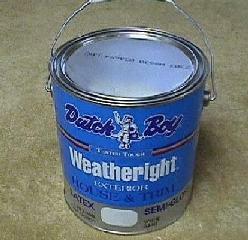 Some good 'white' latex primer and house paint. A respiratory mask for those that might have breathing problems. 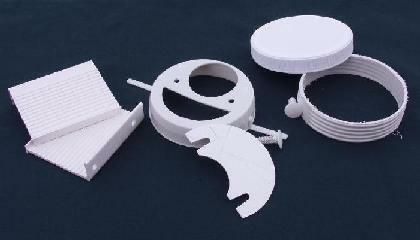 Before you can make your gourds into martin houses, you'll need to order the entrance assy's and access ports. S&K Mfg has some wonderful little plastic parts that work wonders in turning a gourd into a martin house and you will need to order these before you begin actually working the gourds. Simply call them (1-800-764-8688) and tell them you need X amount of entrance assy's and access ports. They'll have them in a box and shipped off to you in no time. As you'll see further down this page, they are very easy to use and the entrance holes are very accurate. No messing with measuring anything. OK, on to making martin houses from gourds. 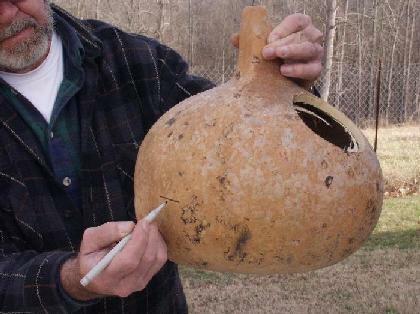 Once the gourd is finally dry, (and some can take months to fully cure), it will require cleaning. The outside skin will have all the residue on it that remained during the curing process. This will range anywhere from just a light coating to something that looks like the one shown below. 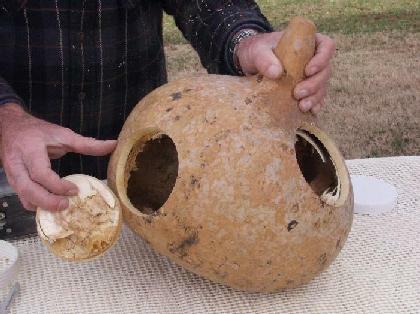 Even though the gourd has a lot of this residue on its outer skin, there is nothing wrong with it. It simply needs to be cleaned off. The first thing to do is to "cut" the stem. If not already cut in the field at harvest, using a pair of pruning shears, (or sharp utility knife), 'cut' the stem around 1/2" long from the gourd. I like mine to be about 2 inches long, because I like the way it looks, but the length is not important.. When adding the entrance hole, I actually make it a point to add the hole directly under the remaining portion of the stem. The martins sometimes sit on these stems, so leaving them a little something to perch on is not all that bad. Never "twist" off a stem. They are very stringy and it really doesn't look all that great. The dust from gourds is very acidic and does have an effect on folks that have respiratory problems. If you are one of these folks, it is advisable to wear a respiratory mask so that you don't breathe in these dust particles or use an alternative method to sanding. If you only have a very few gourds to do, one method of cleaning the residue off is to sand if off. Now, I'll say this up front. 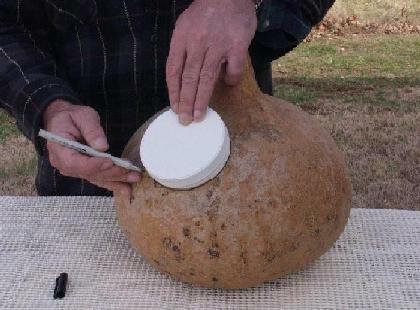 I don't like this method because if you are new to this and don't know a lot about sanding gourds, there is a very good chance of sanding thru the outer hard shell, and that is something you do not want to do. 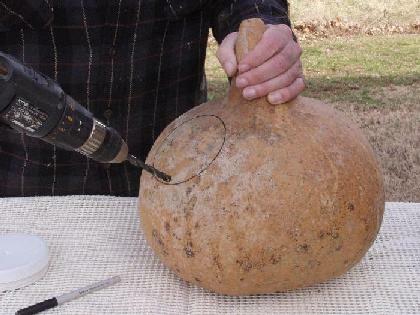 The outer skin of a gourd should never be broken. However, here's how it's done anyway. Using about a 100 grit sandpaper (or finer), you can use a palm sander if you have one available and sand off any excess residue and again, be careful. A power sander will quickly break the hard outer shell and as stated, you don't want to do this. If you don't have a power sander, you could simply put the sandpaper over a small block of wood and sand away, however, this tires the arms pretty quickly and is time consuming. A small block of Styrofoam also works very well. It's soft and will conform to fit the curves of the gourds better. 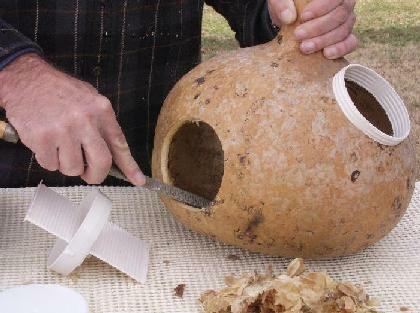 A second way to clean gourds is a whole lot easier than sanding. Purchase a little metal scrubber and then get a bucket of warm, soapy water. Just about everyone has old 5 gallon buckets laying around and they will work just great for this project if you only have a few gourds to do. However, if you have more, then a little larger container will work better because it's nice to have a little extra room to work. I got my scrubbers and container from Wal-Mart, but they can be found just about anywhere. 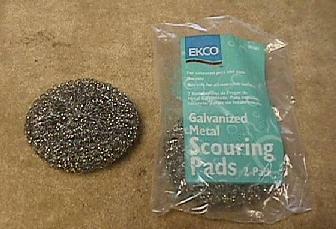 Then, using these small hand held metallic scrubbers, simply scrub the debris off. These can also be purchased in just about any grocery store in the kitchen aisle and they do a wonderful job. One tip here, let the 'dirty' gourds sit outside for a while under a water sprinkler of some sort. A soft rain on them for an hour or two works wonders to soften that outer crud. 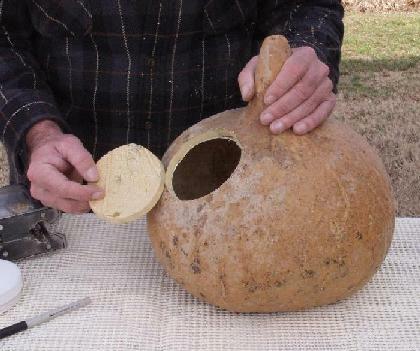 No, this will not soften the original gourd in any way. 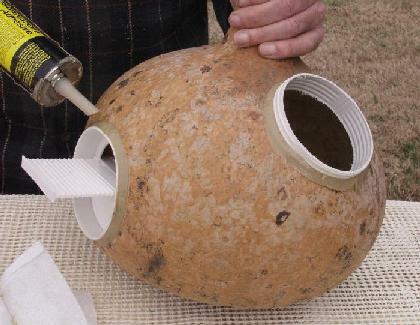 The water softens the residue on the outside of the gourds and it easily scrubs off with the pad. These pads work great at removing the debris and there's no gourd dust flying all over the place for those having respiration problems. Simply set the gourd in the pan or bucket of warm water and start scrubbing away, turning the gourd as you go. If you have a bunch to do, then you might also want to purchase a pair of thick rubber gloves to save on the hands. Clean it as much as you like, then set it aside to dry or simply towel it dry with a paper towel. Don't try and remove every spot. Some of them are discolorations in the skin and they won't come out and besides, you're going to paint the gourd anyway, so they don't have to be perfect. However, a third method I've found to be even easier is to use a pressure washer and PRESSURE WASH the dirt and debris off. Yes, this works wonderfully and if you have a lot of them to do, then you might want to consider this method. No dust to worry about here. No tired arms or sore hands either. Many folks have these little home pressure washers around now a days and this method works great. I made a small, but heavy stand with two sides and a back out of welded screen making a little open cage so to speak. If you want to make one, it's 18" wide x 20" deep x 13" high. The wire mesh can be anything you have around as long as the holes are big enough to let the debris through. Although it doesn't show very well here, I lifted the front up 1" before I screwed the two front legs on. This allows the gourds to always roll towards the back of the jig. Again, let the gourds sit for an hour or two under a water sprinkler to soften the debris on the outsides. 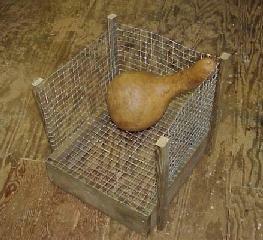 Then simply place the gourd in the stand and spray away. 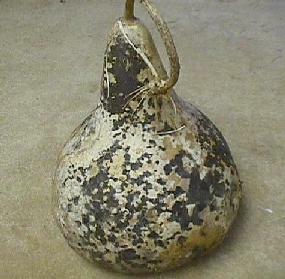 The gourd often turns around by itself as the spray hits it and there is seldom any extra handling. One more caution here. You might want to wear some safety glasses and a good rubber apron or rain coat. Yes, it can be wet with the occasional spray bounce back, but it's so easy that it makes it all worth the while and if you're careful, it really isn't that bad. Plus, if you do it on a warm sunny day, it isn't bad at all and is actually kind of fun. 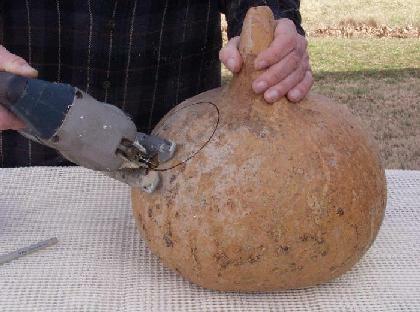 This is also a good way to tell if you have quality gourds with good thick walls. If you have gourds that are thin walled, this pressure washing method will sometimes cave them in and THIS IS GOOD, because if a gourd can't take the force of the washing, then it wasn't of good enough quality to be a martin gourd in the first place. I wash a lot of them and this has obviously become my preferred method. 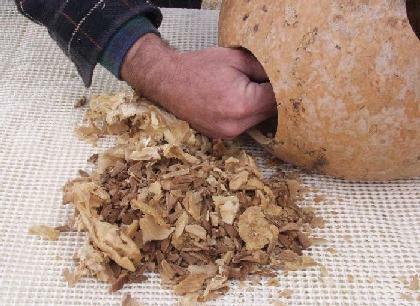 The gourd shown above was washed using this method and so was the one shown in the jig, so you can see the results you get. The next step in the process is to cut the access port hole. Since the introduction of the European Starling into this country, the purple martin has suffered greatly from these fierce nesting competitors and with the advancement of the starling into just about all of the martin's range, starling resistant entrance holes of some sort are a must at any martin site. No, starlings are not a problem everywhere and I've heard stories from folks that they've never seen a starling at their martin site. However, for the majority of the country, this is not so. Starlings have become a very big problem and if this is the case at your site, then I highly recommend that SREH's be used. Starlings must be kept out of martin housing at all costs. For a number of reasons, if starlings are present, then round holes are no longer advisable and many of the responsible housing and plastic gourd manufacturers are changing all their tooling over to them. Some housing manufacturers still insist on using the old thoughts of using round holes on their housing, but unfortunately, they are more interested in their bottom lines rather than the martin's welfare. And best of all, the martins don't even hesitate in using them once they get used to them. My entire site has been changed to crescents and trust me, I stopped having starling problems from the very day I made the change from round to crescent. 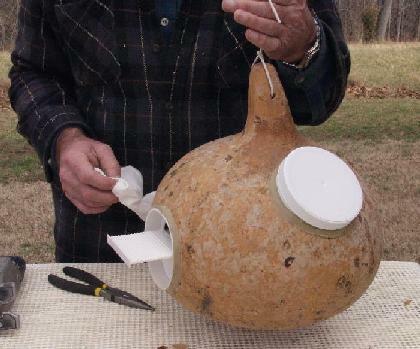 The following is the procedure for adding your entrances and ports into your gourds. Select your gourd and look at it. The first thing you need to do is decide where you want your entrance hole. Maybe mark a small "X" on the gourd to mark the spot. 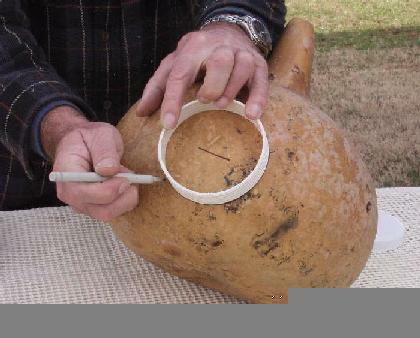 Then, 90 degrees to the right of it, (or left, if you're left handed and want to use that side) and up high on the side of the gourd, lay the port ring on the side of the gourd and draw an outline around it on the gourd as shown. Next, using a drill, drill a 3/8" hole near the bottom line of the ring. This is used to put your jigsaw blade thru to cut the ring out. Next, using the jigsaw, carefully cut out the access port hole. Next, we want to establish the equator of the bulb part of the gourd. To do this, hold the gourd by the neck with two fingers, approximately where the wire will be placed and let it swing freely. This will let the gourd find its natural CG. Now, at the 'equator' of the bulb and where the entrance is going to be placed, carefully draw a level line at this point in the center of where the entrance hole is going to be placed. This will be the centerline of the entrance port. Again, hold the port tube up to the gourd and center it over this line. Then, as before, outline it with the marker. And as before, drill and carefully cut out the entrance hole. Now you need to get the seeds and everything else out of the gourd. No need to scrape it clean, just what ever you can get out with your hands. The 4" holes make this very easy to do. 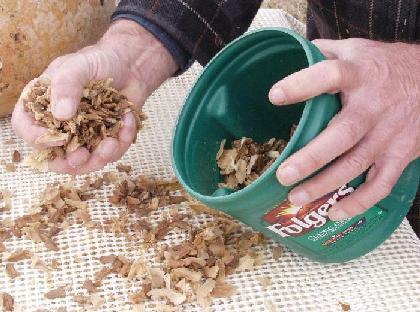 If you have a good thick walled gourd or you plan to grow some, then these gourd seeds should be saved in a good air tight container so they can be kept dry and safe from varmits. Take time to soak them in Copper Sulfate. If you plan to soak your gourds in Copper Sulfate, then now is the time to do that. Copper Sulfate is not a preservative, but instead is a fungicide and will kill all the bacteria and fungi that instigate the rotting of a gourd. Soaking a gourd in this mixture for about 30 minutes will kill all these fungi. Simply mix your Copper Sulfate, 1 pound to 5 gal of water in a container large enough to hold a couple of gourds. I do a lot of them, so I use a large plastic garbage can. Stir it up good and then submerge the gourds under the water for at least 20 minutes. I use a stick stuck in one of the holes and push it down into the mixture. A weight tied to the other end of the stick holds the gourd under the water. This one action makes them last much longer than if they were not soaked at all. After soaking for at least 30 minutes, drain and then set your gourd aside for a day to fully dry. It will have a greenish tint to it from the sulfate, but don't worry, it will be all covered up by paint anyway. And no, you don't have to worry about the green inside, the martins don't mind at all. Do not rinse them out to get rid of any excess sulfate from the inside. This would be defeating the purpose of soaking them in the first place. Copper Sulfate is not harmful to the birds. Don't just dump your Copper Sulfate out when you're done. 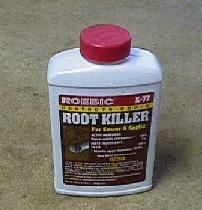 It will kill plants, and in fact, is used for that purpose in septic systems. If you're on city sewer systems, then it can be discarded that way. But if you're out in the country, make sure that where you dispose of it will not harm any plants or get in any water systems. I actually leave the top off my garbage can and cover it with a screen so nothing can get into it and let the water evaporate. The Copper Sulfate simply re-crystallizes for use at a later time simply by adding water. Now, with that said, we can start adding things to the gourd. First the port ring can be positioned in the hole you cut for it. If it doesn't fit nice and snug, or fit at all, then use your rasp and carefully work the gourd hole bigger until it does. Insert just a portion of the ring into the gourd, you don't want to go too deep or there won't be any room to caulk and add the screw-on cap afterwards. I like to cut my holes a little on the small side on purpose and then carefully rasp the holes out so that my parts fit nice and snug. Note: I assemble my entrance parts BEFORE I try to install them into the gourd. It gives me a much better idea of how the porches set when the gourd is hung by the neck. Note how the one shown is assembled. Porches should be level with the crescent bottoms. This alone will frustrate any long legged starling to no end. They just can't get down to the hole like a short legged martin can. Crescent on upper side of ring. Outer and inner porches positioned level with the bottom of the crescent entrance hole. Push pins (or screws if used) thru the holes from the outside, nuts to the inside. If push pins are used, squeeze to make a good and snug assembly. If screws are used, tighten good and snug. Now the same procedure can be done for the entrance hole assy. Fit this assy to the entrance hole and if needed, rasp the hole to size. Once it fits the way you want it, hang the gourd with your two fingers as before where the hanging hole would be and make sure the porches are setting level. If not, adjust the entrance assy so that they are. A couple of things here. Don't push the entrance assy all the way into the gourd. Leave the rim sticking out about 1/4". This will allow for caulking. And don't worry if it isn't fitting the gourd perfect, they will be caulked closed anyway and all gaps will be closed up. Now, let's drill the hanging hole. Looking at the side of the gourd, drill it 90 degrees to the entrance as shown, or if you like, parallel (front to back) with the entrance hole...it really doesn't matter. I like mine to go from side to side, but some folks have systems that require them to be front to back. 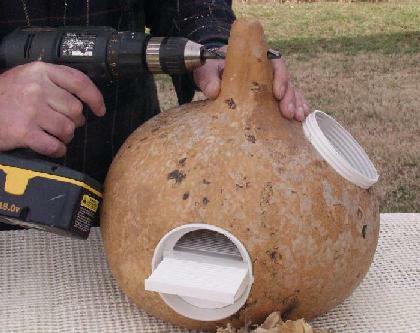 It's your own preference or requirement..
And while your at it, drill at least 3 or 4 1/4" holes around the underside of the gourd for drain holes. This will allow any water that does manage to get in to drain out and keep the nest dry. Now, using the caulking gun and PPCA, carefully caulk around the edges of the access port and the entrance assy as shown. Go slow and take your time. This stuff can be messy, but if done carefully, very little clean up is needed. Also, a wet soapy finger will help work this stuff without your getting it all over. A paper towel comes in handy to clean up any spots that are not wanted. Also, this is a good time to add the hanging wire and see if your gourd hangs nice and level. 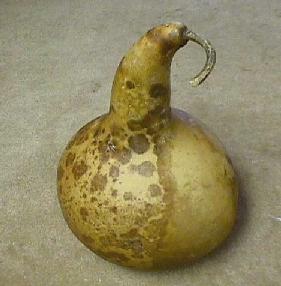 And finally, one very nice martin gourd, ready to let sit and dry for about a day or two. Don't rush. That only makes for a poor quality job. Let time do its thing in drying and curing things. 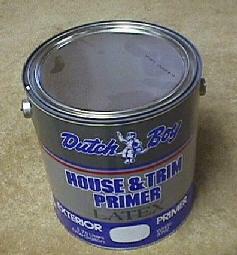 Now once the caulking is fully dry, a 'heavy' coat of a good exterior wood primer can be added. Again, let this dry fully. It needs to dry on the gourd so the paint will stick to it later. And finally, 2 coats of a good exterior white paint should be added to the gourd, with plenty of drying time in between coats. Once dry, these gourds will make wonderful houses for purple martins and if done correctly and taken care of in the off season, these gourds will last many years. ...the entrance edge is stuck out from the gourd by about 1/4" - 3/8" so any dripping dew or light rain will bypass the entrance. ...the martins can now come out of their gourds and look skyward for any impending danger without being hindered by a canopy. I feel that martins need to look up to spot any impending danger such as hawks and I feel canopies hinder this and in fact, I've removed them from any gourds that I add these entrances to just for that reason alone. A lot of work, maybe. But then, this is supposed to be a hobby and is something that can be enjoyed all year long. There's no reason to only enjoy the martins when they are here. Working on their housing while they are gone helps keep the interest in the hobby and building our anticipation of their return and of course, that's what it's all about. Plus, working on them in the off season doesn't require you to rush. You can take your time and do a good quality job. And in the spring, when you first pull that rack up with all these beautiful white gourds, the martins will have a hard time resisting at least investigating them. And I promise, when the martins do return, they'll thank you by filling your hard worked gourds with lots of babies for you to enjoy for many years to come. And, if you take them down and clean them out every year and place them some place dry for the winter, they'll last you for 15 or 20 years if you start with good thick walled gourds. I put mine in large plastic garbage bags and hang them from the upstairs rafters of my shop. Every couple of 5 years, I give them a new coat of paint and they look just like new all over again. And, since the hard work is already done, I simply bring out my little air compressor and spray paint the gourds. It takes me about 1 minute per gourd and I actually hang them on the racks to dry. If you've never used SREH entrance holes before, when your martins see these type holes for the first time, they may seem perplexed at them and apparently have problems negotiating them... DO NOT WORRY. Martins are very fast learners and if your hole dimensions are correct, (which they are right from the factory in this case) they will quickly learn to slip in and out of these holes just as if they had been doing it all their lives, and in fact, some of mine have. They've never seen any other type of hole. (This fear of a landlord seeing them apparently not being able to get into these type holes is known as 'SREH ANXIETY). Give them some time to figure them out and they'll do just fine. If you have a good location and good housing, and they want in, then I promise, they will get in. And I also promise, once you see that a starling is not able to negotiate these holes and your martins can, you'll never regret making the change. The following are a few pictures of items I use just in case they might help you out. Copper Sulfate is easily gotten. 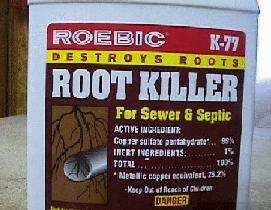 Just go to your local Wal-Mart or K-mart plumbing section and get a product called ROEBIC root killer. As you can see, it's 99% copper sulfate and one can is usually enough to work 16 to 20 gourds with some to spare.